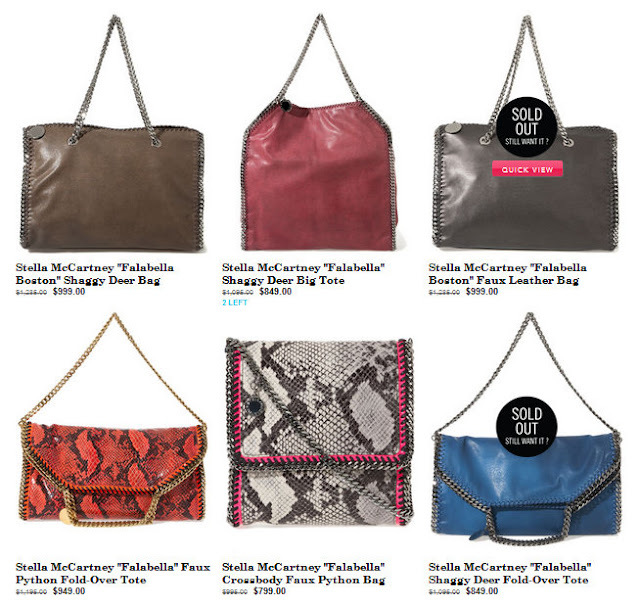 $799, $849, $949, $999... believe it or not, these are all discounted prices for Stella McCartney handbags. Most of McCartney's bags actually retail upwards of the $1,000 mark. While this is expensive, it's not unheard of for handbags these days. Louis Vuitton bags cost around $1,000. Victoria Beckham sells a bag for $14,000. Hermes even has one of its highly coveted Birkin bags selling for $150,000. Within the luxury market, prices run the gamut and Stella McCartney's collection seems like it's on the bargain side of the spectrum. That is, of course, until one detail is mentioned... Stella McCartney bags are made of pvc (plastic)... no leather is ever used. Whereas other notable designers can say their bags are "crafted from the best leathers in the world that last a lifetime" (I won't judge whether that's actually true), all McCartney can say is she hasn't harmed any animals in the process. McCartney is a PETA supporter- I get it. I appreciate that she makes fashionable products for the animal lovers and veganites among us, but I can't appreciate the pricing of her bags. On what planet is it ethical to charge $1,000 for a plastic bag? How does she justify the pricing? It's all in the name, of course! Because she is the daughter of former Beatle Paul McCartney, she can slap her name on virtually anything and people will buy it. Why? Because the media has brand-name brainwashed so many of us to believe that celebrity names are synonymous with quality. (Remember my post on JLO for Kohls). Every time I see celebrity collections an internal alarm goes off: wake-up! wake-up! Look for quality materials and great craftsmanship, Helene! Don't simply assume superior quality is inherent because of the name. Soooo, if after this entire spiel you still decide to buy one of these bags, what exactly are you paying for? Disposable fashion/ the anti-investment piece: If you buy one pleather bag every 3-5 months because it breaks and ends up in the landfill, it's far worse for the environment than buying a new leather bag every 3-5 years. Stella's good-life: By supporting her over-priced bags, you are helping her to afford mansions, catered meals, a trust fund for her great-great-grand kids and many luxe vacations. Stella is laughing all the way to the bank! At this point, you're probably over Stella McCartney. If you're still in search of vegan bags, PETA actually lists ethical fashion companies on its website. Matt and Nat, one of the most common vegan bag brands made the list, but I still find their goods a bit pricey. I recommend you lookout for a brand called Urban Expressions. UE makes on-trend, affordable bags that can be found at many stores including Daffy's, DSW and Century21 (in NYC). Sorry about the commenting spree, you've just got a lot of great conversation pieces going on here! Again, this is an amazing and very true commentary, a lot of luxury items, particularly handbags and shoes, are obscenely overpriced. I appreciate the fact that you not only present the facts, but also give very chic alternates. I had never heard of Urban Expressions, and being that they are a vegan brand, I think it's phenomenal that they can offer great-looking product at fair prices. It has become difficult in a culture of mass consumption to avoid being drawn in by the "big names" and this post is very grounding! Please don't apologize. I love your comments and I'm glad you are entering the conversation. There was a time when I lusted for everything designer although I couldn't actually afford it... with time and age, I came to realize that there are good quality, well designed alternatives available at decent prices. In Italy, close to Florence, there is a Gucci outlet! It was there that I got a chain and canvas Stella McCartney for about 150 euro ;-) I bought a Marc Jacobs bag that was constructed using PVC-type materials and it kept breaking in certain spots, resulting in a sad-looking bag. PVC is also terrible for the environment. Lots of contaminants are used to make it and much of it finds its way into the local ecosystem, of course. So, her little PETA crusade doesn't really help animals. Thank you from all of us at Urban Expressions Handbags! I met you at the IFB conference, thought you might be interested in checking out my recent posts about it! It took me awhile to get them haha. I don't "wish I could afford one." I wish they were AFFORDABLE! This is a month's rent for some ppl. I'll check out your blog... thanks for stopping by! Very good post. I recently starting checking for pvc. I was recently told that they no longer use leather in sneakers, all pvc, but they charge the same price. I started checking the designer bags and I found that MANY of them use pvc, even LV! Great site! hmmm that is interesting. I definitely didn't know that about sneakers. I'm going to start looking at the tags for those now too. I'm not sure what being made in Italy has to do with it since Italy is known for great leathers, and these aren't. I don't work for UE so I can't answer your questions, but I do know that PETA endorses them as a great company and I have seen and touched their products. Fair trade, natural glue and dyes aren't typically enough to increase production costs by such margins.